I am creating a .tap file using SpecNet IDE for visual studio. How do I add a screen$ / loading screen at 16384 to my .tap file - I have seen a few utils that say they do it but I couldn't get them to work - is there a "simple" straight-forward way to do this? There are many ways to to that. Personally, I use Basin's Tape Creator utility -it's simple and gets the work done. But if you need more features to work with tape blocks, ZX Blockeditor is a good option. Thanks for your reply. Sadly your suggestion isn't without it's issues (for me at least). I have tried ZX Blockeditor and just fail each and everytime to achieve adding a loading screen$ to an existiing .tap file. Likewise, BASin once unzipped has a broken help CHM file so it is impossible to learn how the program works. Does anyone have a working, easy for idiots like myself, step by step how to achieve adding a load "" SCREEN$ file to an existing .tap file please? Personally, I use Basin's Tape Creator utility -it's simple and gets the work done. But if you need more features to work with tape blocks, ZX Blockeditor is a good option. Maybe a step by step of how you got the contents of the screen grab you attached please? 5) At this point, you'll have three entries; the previous two and a new one at the bottom, called BYTES with your screen$ name. What's probably missing is, you must modify the initial loader program, to add a LOAD ""SCREEN$ somewhere. Right, but the only way to know is if @dwinters18 paste here the contents of the BASIC loader. @dwinters18, can you do that? First make a copy of your .TAP and load the copy into BlockEditor. Note that the header and data part of each file are two separate blocks that it's up to you to keep together. Delete all but the initial BASIC program and its header and save. That gives you a .TAP with just the BASIC loader. Now load that into an emulator and edit it to insert a LOAD "" SCREEN$ command after the CLEAR statement and before the LOAD "" CODE that loads the main block of code. 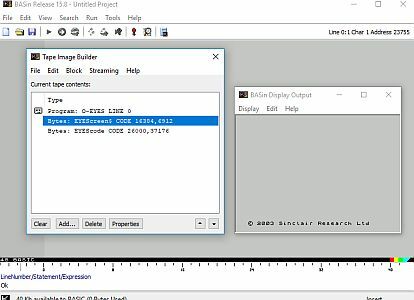 To do that you'll want to turn off auto-tape-loading in the emulator. Then you select the .TAP file, then type MERGE "" to load it without running it. Then when you've edited it, use the emulator's 'Tape for Saving' mode to create a new .TAP file, SAVE "Loader" LINE 10 or whatever to save your edited loader to it, then close/stop the .TAP saving file. This gives you a new .TAP file with just your new BASIC loader in it, set to auto-run. You can edit the file names of each header too, if you want. And if your SCREEN$ was saved from high memory, you can adjust its start address down to 16384. And save that as your final .TAP. It may not be the easiest way, but I use the new-oldschool method in an emulator. Before starting you'll need your loading screen already saved as a .TAP (ZX-Paintbrush can do this), and your game code already saved as a .TAP. ^this puts the stack safely below your game code; loads the loading picture; the POKE 32739 is a trick to avoid the BASIC overwriting your screen with the Bytes:xxxx message when your game code loads; the PAUSE 0 waits for a keypress after loading, that way people get to see it even with flashloaders; the final CLEAR removes your POKE 32739 from earlier (it can cause problems). In your emulator of choice, I use SPIN, insert a tape, and type SAVE”name”LINE 1. The line 1 is important, as it makes the BASIC autorun when loaded. 2-So now your BASIC loader is commited to tape. You’ll need your loading screen already saved as a .TAP file. Go File>Load, and load your picture somewhere safe in memory (40000 will be safe at this point). SO LOAD””CODE 40000. Then type SAVE””CODE 40000,6912. You loading screen is now committed to tape. An alternative way to learn would be to download a game already done (one of mine here has a similar loader). And open the TAP in ZX-Blockeditor. You can copy cut and paste, even edit your own loading screen with it.